November is a month of remembrance. It’s when we honour the memories of loved ones who have died. 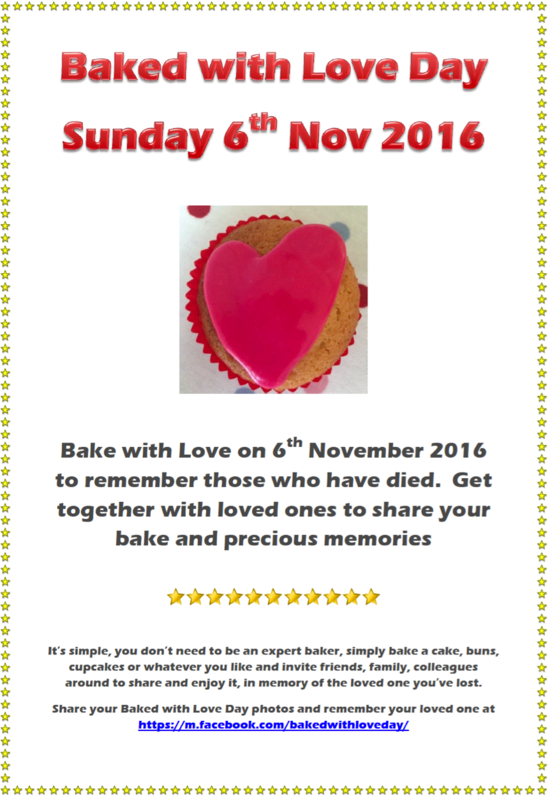 On Sunday 6th November I invite you to join me in this year’s Baked With Love Day. It’s an opportunity to share your memories (and your bakes) with family and friends. It’s simple, you don’t have to be an expert baker to take part (the non-bakers among you could always nip out to the shop). It could be your loved one’s favourite cake or in my case it’s something that I expected to be baking with Conor. Use the baking time to reflect, then put the kettle on, sit down with those around you and take the time to share your bake and your memories. After all, who doesn’t like cake?!! Since Conor died, baking has become part of his story. In those early months it gave me a purpose during an empty maternity leave. Since the busyness of life returned, baking gives me valuable “Conor time” when I can reflect and simply feel. Baking was the inspiration for many Cakes for Conor posts. There is something very special in being able to make something from scratch to share with others. It really is an act of love. This year I will be baking fairy cakes (called buns here in Ireland). They are the cakes of my childhood and something I’d expected to be baking with my children. As a child I remember waiting patiently for the cakes to bake and cool down. I remember the delicious smell coming from the oven. I remember the joy of licking the bowl of sugar icing. I remember scraping my teeth on the cake case to get out every last crumb. As a family we sat down together to eat cakes and chat. These really are special memories. Please share with those who you think would like to honour their loved ones in this way. It’s a lovely idea. I will definitely be baking too!